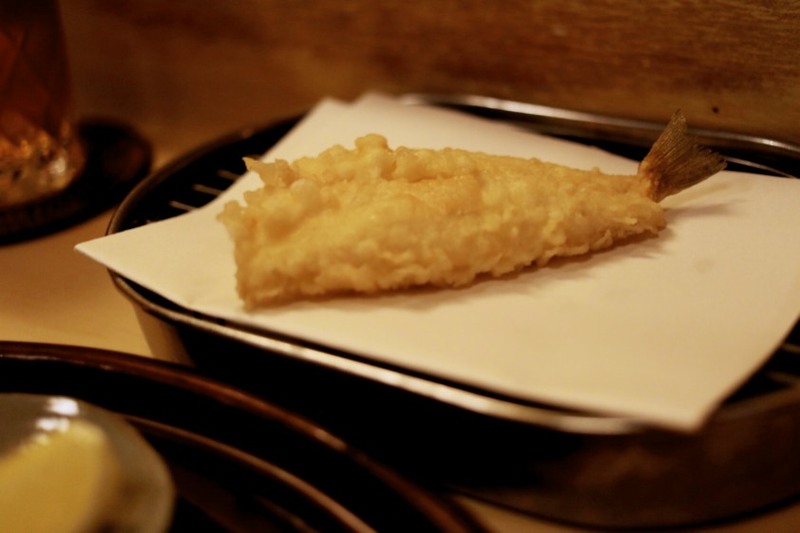 Tempura is one of the three cuisines that originated from and defined the Edo period (also known as Edo no Zanmai – 江戸の三味) when Tokyo became the capital (1603 – 1868), alongside sushi and soba. 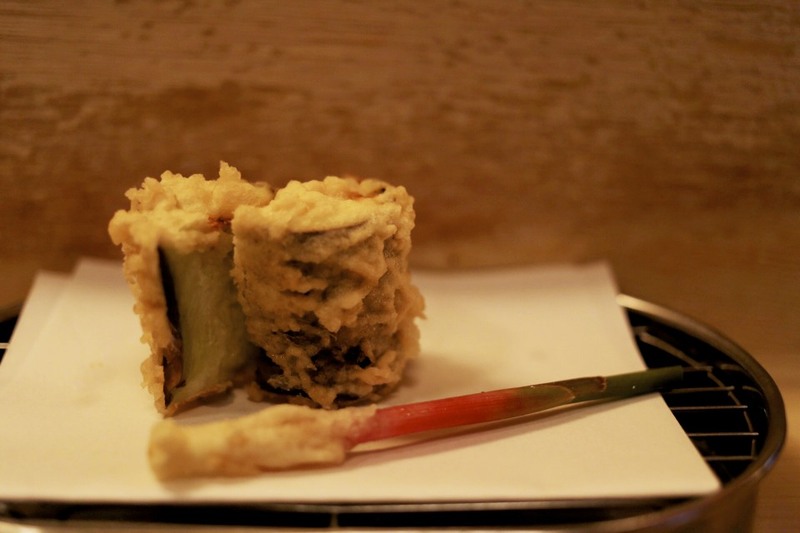 Given the importance of the cuisine, there was no way that we would be missing out on at least one good tempura experience in Tokyo where it all began centuries ago. 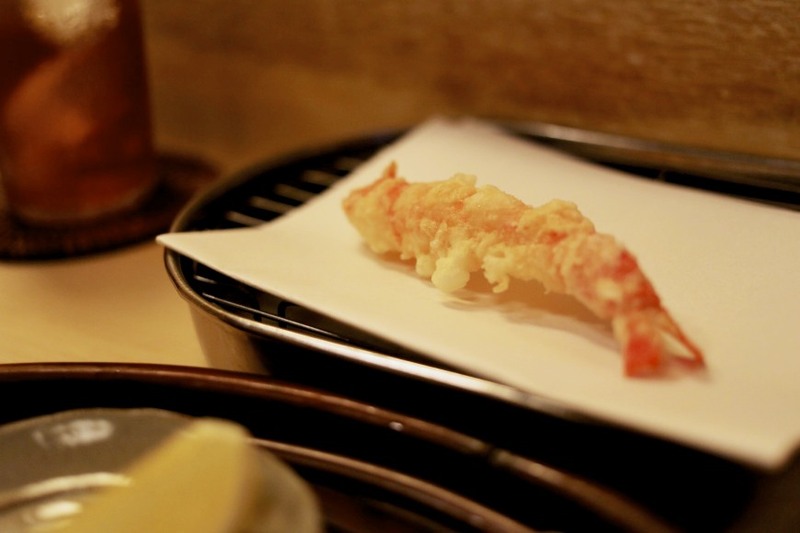 Fortunately there are a number of 2-Michelin starred tempura restaurants in the capital. In the end we decided to opt for Rakutei (楽亭) in Akasaka, which specialised in Edomae tempura; that is utilising seafood and vegetables that were available and caught in the vicinity of Tokyo during the Edo period. Reservation is necessary for this 11-seater restaurant. 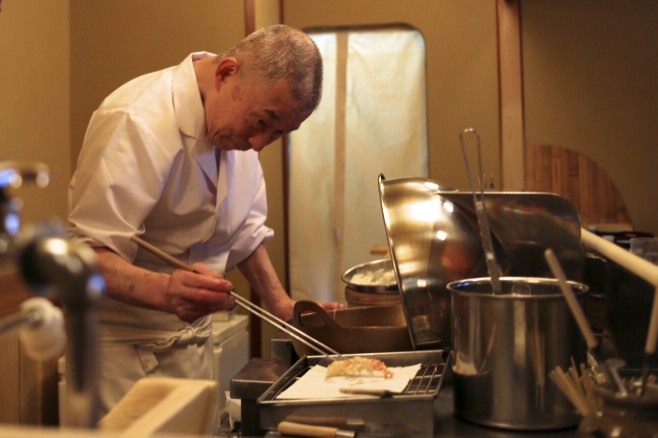 Just like the chef’s from other famous tempura restaurants like Kondo and Fukamachi, chef-owner Ishikura Shuuji trained at the famous Hilltop Hotel restaurant before going independent in 1970. There were only two options from the menu, starting with the cheapest at 11,000 yen and the most expensive being 13,000 yen. Given the difference between them was only the number of prawns you got, we opted for the cheapest one to leave room for dinner. 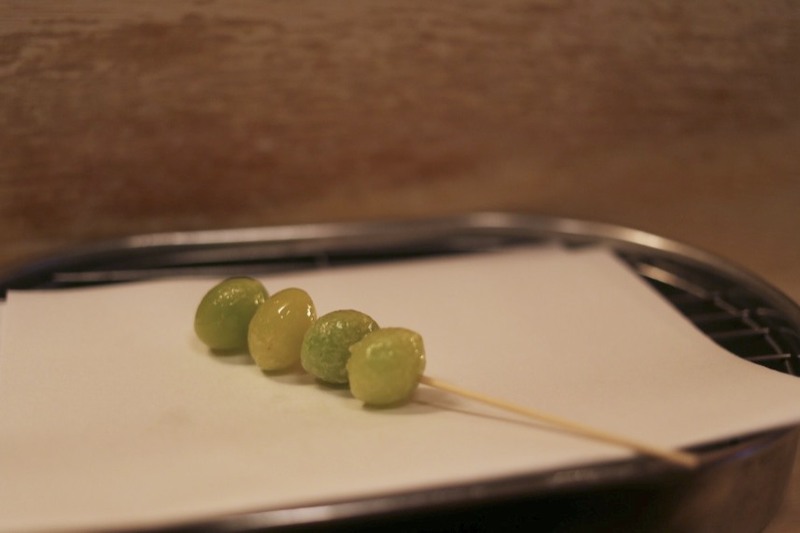 As soon as our orders were taken, Ishikura-san began preparing the oil and its temperature. 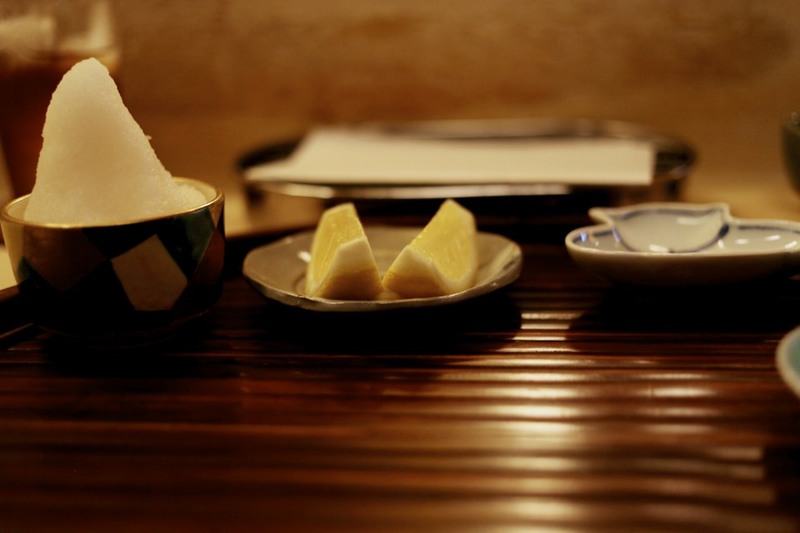 As Ishikura-san had to adjust the temperature of the oil for each course, the meal could not commence until every diner was present as everyone’s meal was served simultaneously. A wet hand towel was brought out to everyone with me being the exception (this wasn’t rectified until half way through the meal when I had to point it out). The apprentice, and only aid behind the counter, wasted no time in preparing our appetiser of Bonito salad, or Sakizuke no katsuo nuta ae (先付の鰹ぬた和え). Unfortunately, it was rather chewy and I felt the fish was dominated by the white miso dressing. 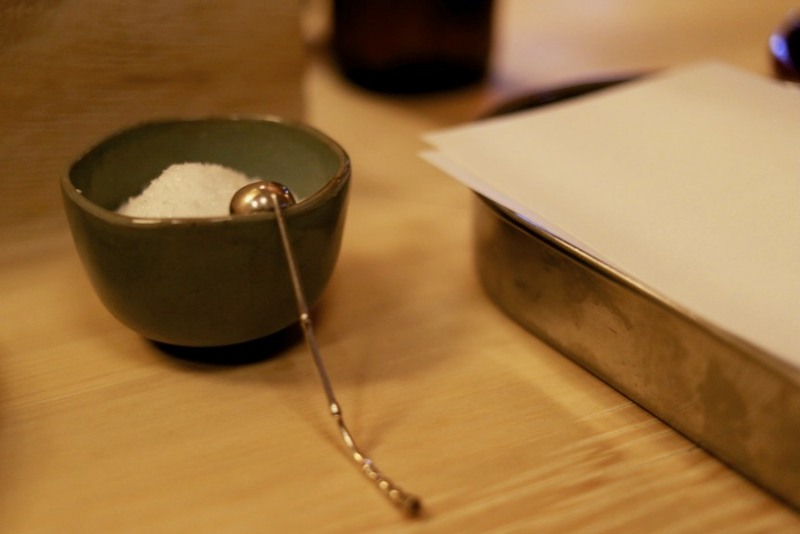 … or plain old salt. I personally preferred to just have salt for most of the courses. There was no doubt the ingredients being used here was fresh. The prawns were still moving when Ishikura-san brought them out. Each prawn was handled with the utmost care and prepared methodically. The chef made the process look effortless but the slicing, trimming and peeling was done at speed with flawless precision that captivated all of us. He must have done this thousands of times. Each prawn was lightly slashed across the belly before being coated in the light batter. For the cheaper menu, two Prawn Tempura’s (海老) were served in comparison to four, and in hindsight we made the right choice. The prawn had a natural sweetness and worked particularly well with just salt as it allowed you to appreciate its freshness and natural flavour. Despite this, I was not blown away from essentially what should have been the star dish of any tempura restaurant. I found the texture of the prawn a little drier than I’d like, absent of that expected juicy explosion at first bite. 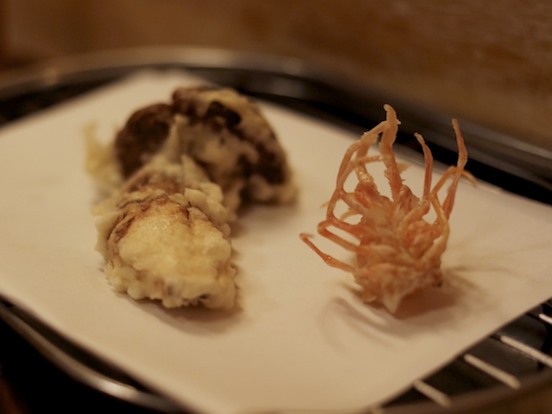 The meal did however pick up with a serving of the delicious and salty Prawn Head (海老の頭) and Matsutake mushroom (松茸). The prawn head was divine with its crunchy texture and depth of crustacean flavour, far superior to the body of the prawn itself. I did wonder though, why did we only get one head when we had been served two prawns? The matsutake was satisfyingly meaty and oozed of its delicious juice. This was more like it! You could distinctly notice the change in the application of the batter and the temperature of the oil with the Garfish, also known as Kisu (鱚). There was a thicker coating of the batter and it had been fried at a much higher temperature to penetrate the thicker fillet of the fish. Lemon and salt did the perfect trick for this course. What surprised me most was the absence of oiliness despite the thick batter, leaving you with just the flavour of the fish. 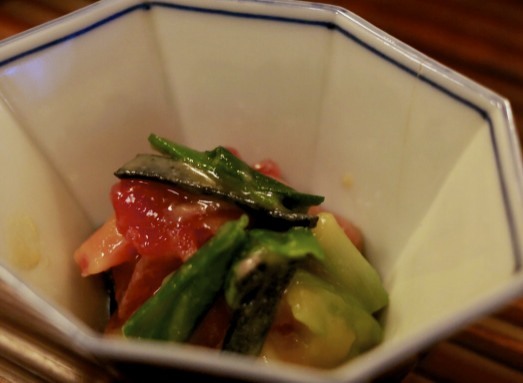 One of the two stand-out dishes of the meal was undoubtedly the Long Aubergine or Naga-nasu (大長茄子) from Kumamoto prefecture. I loved the contrasting texture of the soft moist flesh against the crispy batter. 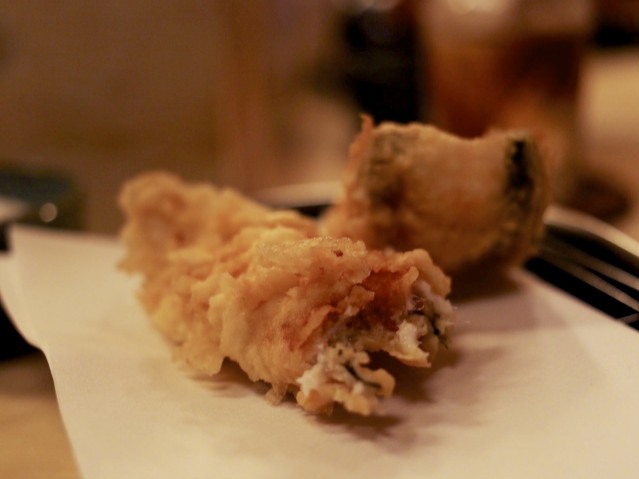 The aubergine has been deep-fried to retain as much moisture as it could before it was sliced in half for plating. A ginger stem tempura was then served to clean the palate. Ishikura-san changed his oil after this course to maintain the freshness of the next few courses. Shame the same level of attention wasn’t paid to the service as we had run out of water and tea for some time and there was no sign of any impending top up. 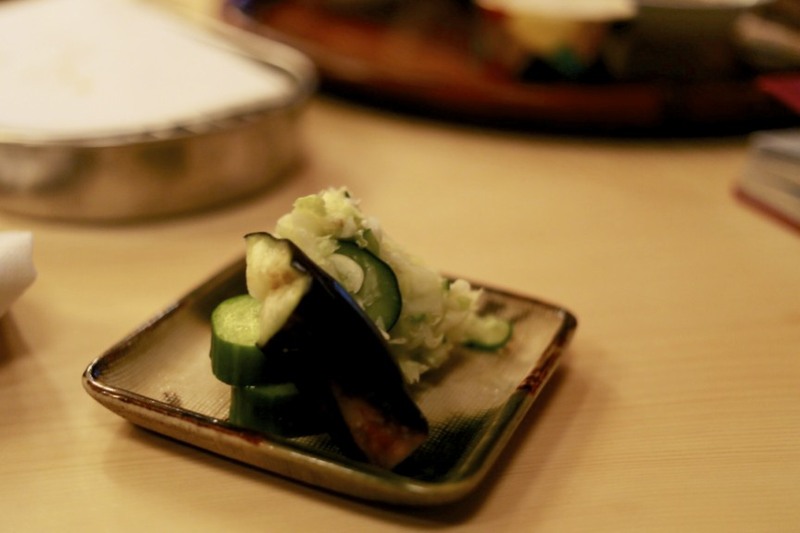 The second star dish of the meal was the Ink Squid or Sumi-ika (スミイカ). I’d never encountered such a delicate texture with the flesh having hardly any resistance to bite. The entire piece just dissolved in my mouth effortlessly and we were all left speechless. Wow. 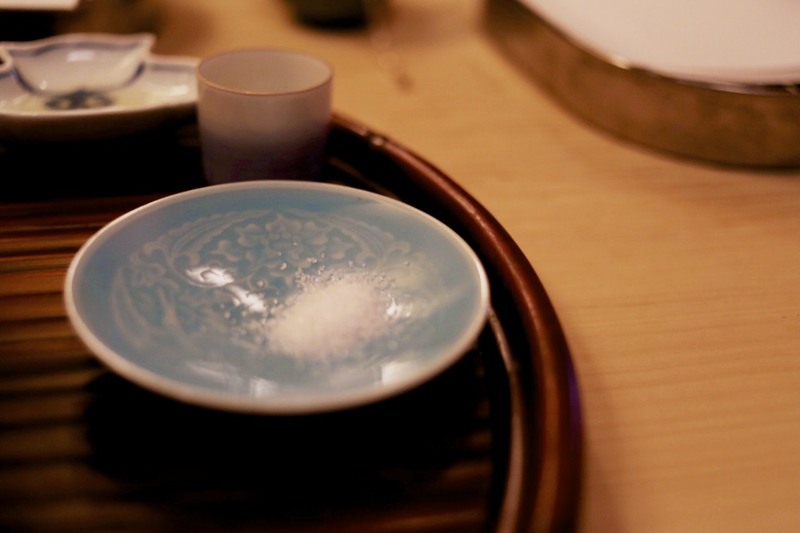 The Conger eel or Anago (穴子) in comparison felt slightly too oily, unrefined and tough compared to the other courses. The toughness in truth was due to the fact that it had been cooked slightly longer than it probably should have. Mind you, at least the flavour was good and its only saving grace, although admittedly it was difficult to hide our disappointment. To finish our meal we were served a plate of Japanese Pickles or tsukemono (漬物) and given a choice of having our Kakiage (かき揚げ), essentially a concoction of various ingredients, in this case clams, being deep-fried together in a batter, prepared in a Tendon (天丼) which is on a bed of rice, or Tencha (天茶), which is in a bowl with a tiny bed of rice and tea. 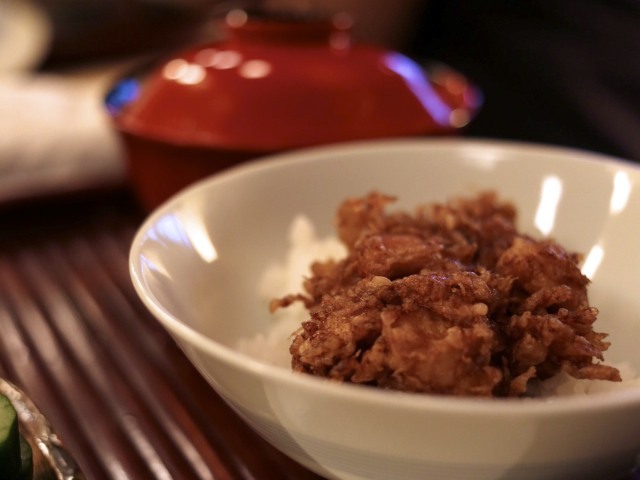 I opted to have my Kakiage as a Tendon. 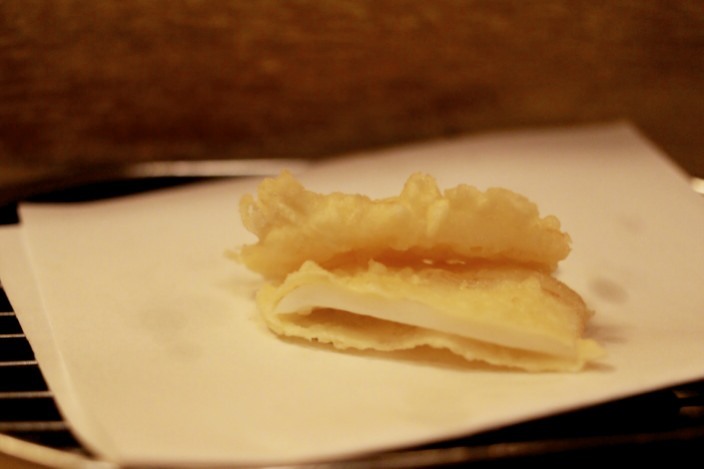 The Kakiage was made from the muscular part of the round clam, known as Kobashira (小柱) that had been sourced from Hokkaido. Whilst the flesh was very soft and sweet, I felt there was far too much batter for the amount of the delicate clam, making it rather more doughy than i would like, albeit crunchy on the outside. 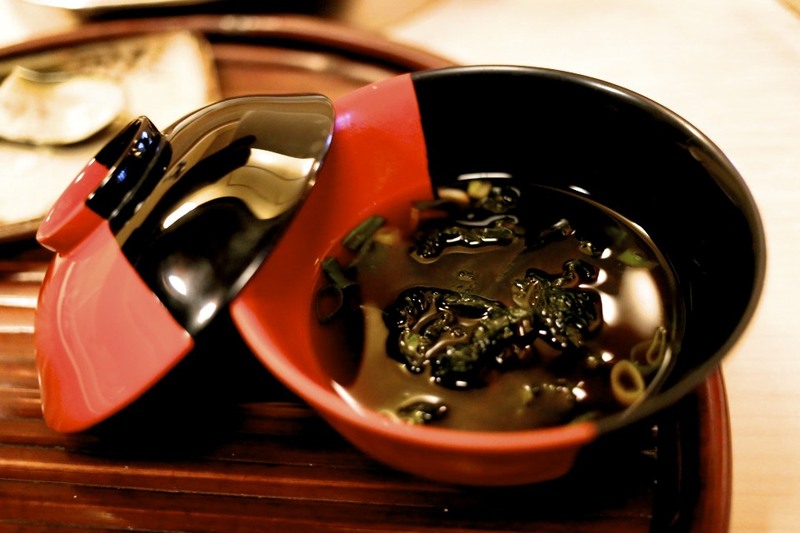 We reflected over our meal as we sipped on our red miso soup, Akadashi (赤だし) and waited for our bill. We all had mixed feelings about the meal. There were some clear winners like the sumi-ika and naga-nasu that were a world apart from any tempura we had ever tried previously but we couldn’t overlook the inconsistency in the quality of the tempura, not to mention the simple mistakes in the service such as my missing wet hand towel and tea not being topped up. For the same price we had a far better and memorable meal at Ishibashi. 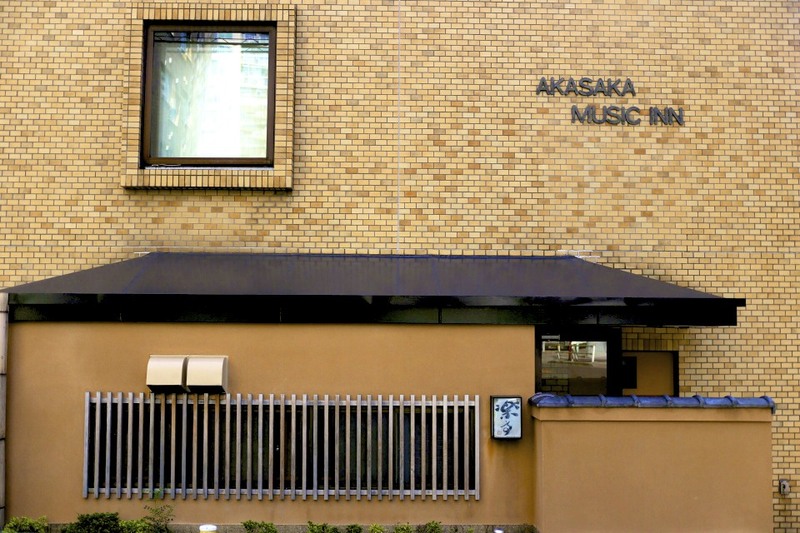 This entry was posted in Japan and tagged anago, Edomae, Ishikura, Japan, Kisu, Michelin, naga-nasu, Rakutei, sumi-ika, Tempura, Tokyo on October 31, 2014 by admin.